The Russian Ministry of Defence ordered two Project 23550 Arctic patrol vessels in April 2016. Image courtesy of JSC "The Admiralty Shipyards". Keel-laying ceremony of Ivan Papanin, the lead icebreaker in the class, was held in April 2017. Image courtesy of JSC "The Admiralty Shipyards". The Ivan Papanin icebreaker is scheduled to be delivered to the Russian Navy in 2020. Image courtesy of JSC "The Admiralty Shipyards". Artist's rendering of Project 23550-class multipurpose patrol ships. Image courtesy of The Ministry of Defense of the Russian Federation. The Ivan Papanin (Project 23550) class is a fleet of two multipurpose patrol icebreakers being built by JSC Admiralty Shipyards for the Russian Navy. 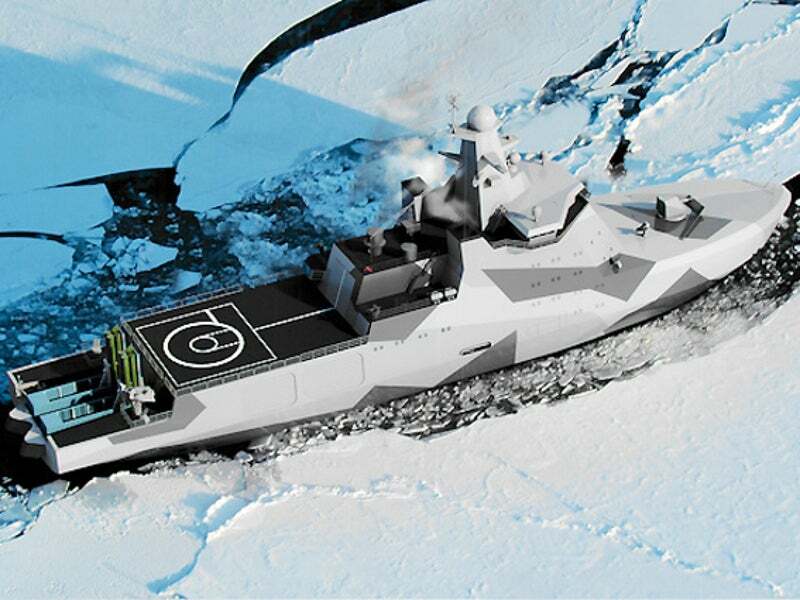 Designed by JSC Almaz Central Marine Design Bureau (CMDB), the vessels are intended to perform the Russian Navy’s missions in Arctic waters. The vessels can operate independently and alongside other warships. A contract for the construction of two Project 23550 multipurpose icebreakers was awarded by the Russian Ministry of Defence to Admiralty Shipyards in April 2016. Construction on the lead vessel in the class, Ivan Papanin, began in September 2016 and the keel-laying ceremony was held in April 2017. The ship is expected to be delivered to the Russian Navy by 2021. The Ivan Papanin-class Arctic patrol vessels are ideal for missions such as monitoring and protection of Russian Arctic waters, rescue, escorting of ships in polar waters, transportation of special equipment, towing of ships in the port of detention, and maintenance and support for service vessels. The ships can also be used to offer protection for vessels operating in polar waters from air, sea and coastal targets. The Ivan Papanin-class polar icebreakers will be built with a strengthened and reinforced hull to enable it to move through sea ice. Each vessel will have a length of approximately 110m and a width of 20m. With a displacement of 8,500t, the vessels will be able to accommodate up to 60 crew members with an option to carry additional 50 members. A flight deck and a hangar will be fitted on the main deck towards the stern to support the operations of a single Ka-27PS anti-submarine helicopter or a Ka-27PL search-and-rescue helicopter or an unmanned aerial vehicle. The vessel will house two high-speed patrol boats of type Raptor (Project 03160)-class of the Russian Navy. Located on the starboard side of the ship, the boats can be used to conduct a variety of tasks such as search-and-rescue, anti-terrorism, patrolling, and anti-sabotage. The bridge section will be situated amidships, providing operators with an unobstructed view of the sea. A fire control system and a range of radars and communication antennae will be placed on top of the bridge structure to provide safe navigation of the vessel. The Russian Navy’s Project 23550-class polar icebreaker ships will be armed with one AK-176MA automatic naval gun system developed by JSC CRI Burevestnik. "A contract for the construction of two Project 23550 multipurpose icebreakers was awarded by the Russian Ministry of Defence to Admiralty Shipyards in April 2016." Mounted on the bow, the artillery gun will provide defence against sea, air and shore-based targets at a distance of up to 15.7km. It has a rate of fire between 120 and 131 rounds a minute. The armament also includes four Kalibr-NK anti-ship / anti-submarine / land-attack subsonic cruise missiles, which will be launched from two quadruple canister missile launch systems located at the stern of the ship. Each vessel in the Ivan Papanin-class will be powered by two electric motors rated at 4,080hp each. It will also be equipped with two bow thrusters and azipods to perform safe manoeuvres at sea. It will have a speed of up to 16k and a range of up to 6,000 miles. It will be able to operate in Arctic zone for up to 60 days. The icebreaker vessels will be capable of moving and navigating through 1.5m-thick sea ice crusts. This project forms part of our recent analysis and forecasts of the global Naval Surface Combatants & Warfare Systems market available from our business information platform ‘Strategic Defence Intelligence’. For more information click here or contact us: EMEA: +44 (0) 20 7936 6783; Americas: +1 (0)415 439 4914; Asia Pacific: +61 (0)2 9947 9709 or via email.